This Esri map of 2015 UK Election Candidates is a beautifully simple map. 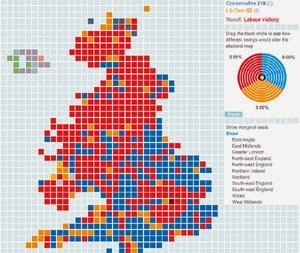 The map simply shows each UK constituency and the candidates standing in each of those constituencies. The labeling of each constituency sacrifices orientation for font size, choosing to use larger fonts rather than smaller fonts which will fit horizontally within each constituency boundary. The result is actually very aesthetically pleasing. It may make some of the labels a little harder to read but most users will presumably have some idea where their constituency is on the map. If you don't know where a constituency is you can simply use the search function any way. While the UK Election Candidates map is simple and informative Google's Election 2015 - The Final Debate is neither. The map shows searches on Google for each party leader during the BBC's UK Election debate on April 30th. I guess the map gives some general sense about who people were searching for on Google during the debate and when & where they were searching. I'm just not sure why I should care or what I can learn from the map. The data behind the map might possibly be informative about the general support for each of the party's leaders but it really isn't useful presented in this way. The Guardian's Election Map and Swingometer is another simple and informative map. One of the big problems with showing the results of UK elections on maps is the irregular size of the constituencies. When you color a map of the UK by the party colors of the successful political parties you tend to present a misleading picture of the representation of the different parties in the UK. In general terms the Labour party tends to perform better in the geographically smaller inner city constituencies, while the Conservative Party tend to perform better in the geographically larger rural constituencies. The result might mean that users will have some difficulty picking out the correct constituency on the map, however, the search option means users can still quickly identify the constituencies which interest them. The Daily Telegraph has released a Google Map of the marginal seats in the UK election. The Telegraph's map divides the country into safe constituencies (seats that are likely to vote for the incumbent political party in the seat) and marginal constituencies (seats that might change hands). The map is useful as a general guide to which UK seats are most likely to determine the outcome of the UK general election this coming Thursday. The large number of seats in Scotland (many of which look likely moving from Labour to SNP) and in the South West (some of which look like moving from Lib Dem to Conservative) are likely to have a big impact on the UK election and what looks like being very interesting discussions after the election about which political parties will form the government. Bet 2015 has released a UK map showing who they think will each parliamentary seat based on the bets placed on individual candidates. The Bet 2015 map currently predicts that the Conservative Party will win exactly 13 more seats than the Labour Party. Each constituency on the map is colored to show the party of the predicted winner. You can also change the map view to show the current holder of each seat.